Yeah, I know it is. 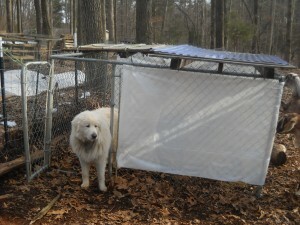 It is a dog shelter built from a broken 8X8 kennel, an eight foot pallet, a four foot pallet, two new roof panels, two old roof panel scraps (not coordinated), some plastic sheeting attached with wire, and everything else held together with baling twine. Very cool. It even has a raised lounging platform inside supported by a rock, a piece of 2X4, a cracked concrete block, and a dirt mound. Not just anyone could build this. The children, recently released from the school bus, prowl the new addition and ooh and ah over the details. Both red and green twine have been used to create visual contrast. The 3/4 roof provides an atrium for taking in the sun or al fresco dining. The three foot wide sheeting covers the four foot tall walls with just enough space left for private observation of the neighbors and adequate ventilation. 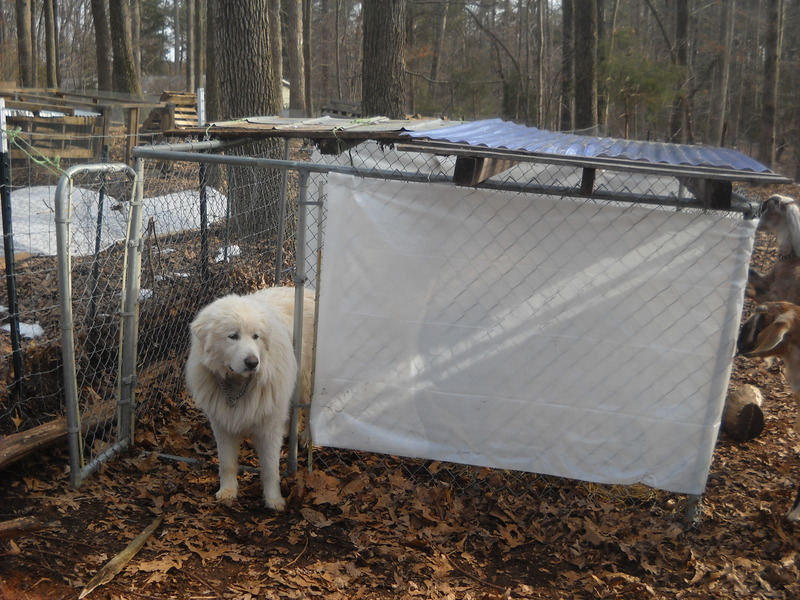 You can say I ran out of wire for attaching things, that I didn’t have enough leftover roofing materials to cover the whole thing or that I forgot to measure the height of the kennel before buying the plastic sheeting. I say, communities of McMansions and a society of conspicuous consumers have made you jaded. This is a break through in agricultural design. Not everyone can handle such avant-garde, but we are progressive on our farm. “Yes, I know. That’s because she lives in the city limits.” We shake our heads sympathetically. “Yes, I know. That’s because they have a homeowners’ association.” We shudder. Yeah, I know. And that’s why I have four kids. No one appreciates an eclectic combination of function and creativity in design like the under 12 age group. 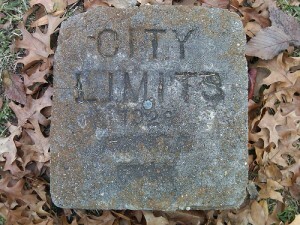 May their tastes always remain unfettered by society and their houses always be just past the city limits sign.